Improve your skills managing and using Security-Enhanced Linux with this helpful guide. 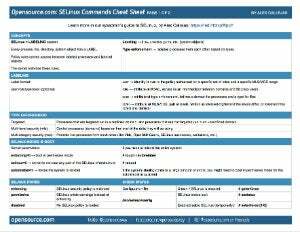 SELinux may seem complex at first, but with the right cheat sheet it can become a powerful ally for sysadmins. This guide is designed to help you to improve your skills managing and using Security-Enhanced Linux. For more in-depth information, read A sysadmin's guide to SELinux: 42 answers to the big questions.